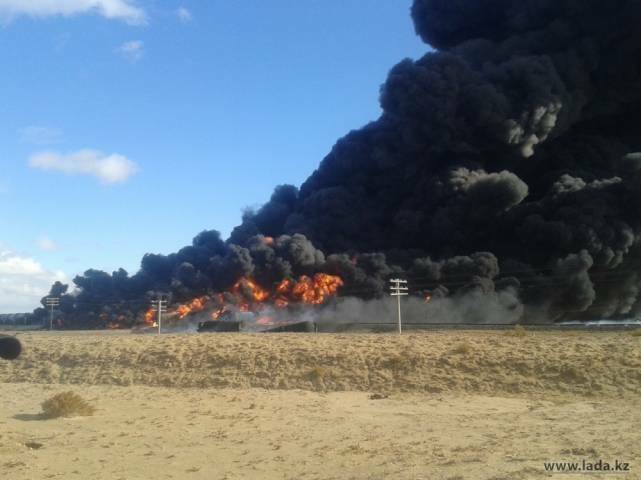 The largest state of emergency happened to a fuel truck and train on Saturday near Aktau, BNews.kz correspondent reports. As a result of collision of MAN fuel truck with locomotive carrying 18 tanks with oil, the locomotive and its 10 tanks burned down. 24 year old assistant driver of a locomotive Zhasanov died. 33 year old driver Kulbarakov is hospitalized with burns. According to the transport prosecutor’s office, oil truck driver Sundetov stopped the car at a red signal of the crossing’s alarm system and without explanation resumed movement in close proximity of the approaching train. The management of Emiroil LLP which owns a fuel truck, doesn’t deny its responsibility. However the company refused to comment on state of emergency.